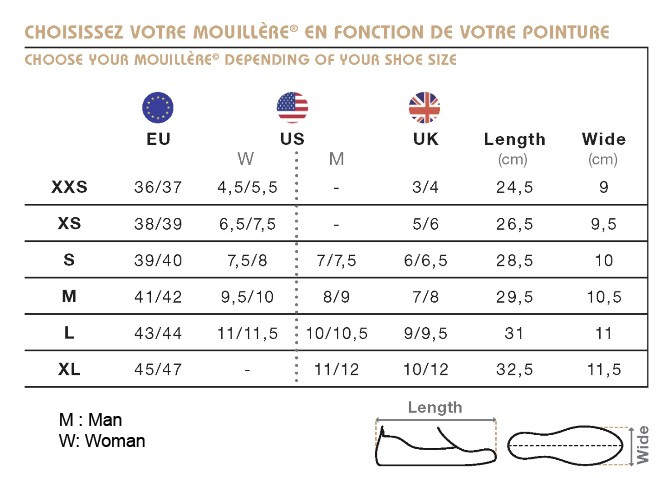 The size of the mouillere® has been defined taking into account the outside of your shoes. 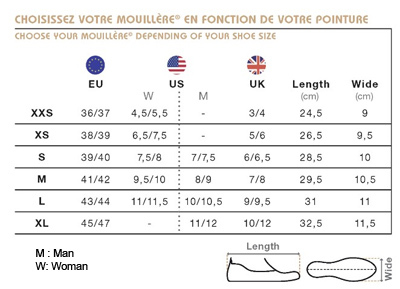 Therefore you can choose your mouillere® size directly from the above table. The mouillere® has a single shape for both feet. with the tongue of the mouillere® you can adjust it to your shoes. This is how it will be the most confortable. Maintenance: You can clean your mouillere® with a sponge, soap and water. Usage: The mouillere® can be used on different grounds. You should however avoid surfaces with edges (rocks, sharp things ...) that can cut the material. You can personnalize your mouillere® either manually with a pen or by laser (in this case please scontact us for more informations). Finally, dont 't forget that mouillere® is an excellent accessory : you can match the color with yourtie, your scarf, handbag ... dare to wear color, it is a way to bring a good mood! • Warning : On some soils ( glass, marble , metal, ... ) the mouillere® can slip . It is advised not to use overshoes on escalators.